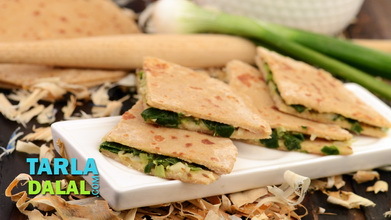 Aloo Paratha is a dish wish a universal appeal! 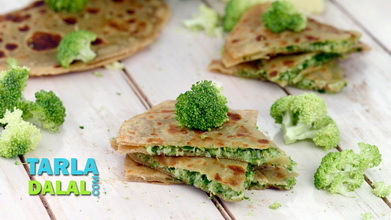 While north Indians like to have it any time of the day, for breakfast, lunch or dinner, south Indians too have borrowed this dish from the north and incorporated it into their supper and dinner menus. 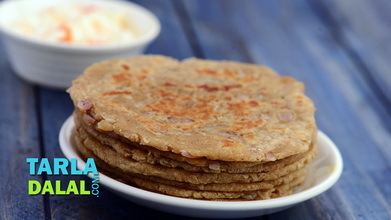 What makes these whole wheat parathas so appealing is the soft and tasty filling of potatoes flavoured with peppy spice powders and crunchy onions. 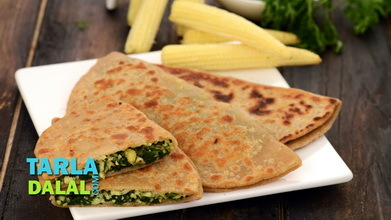 Green chillies spike up the flavour of the stuffing, while amchur gives it an enjoyable tinge of tanginess. 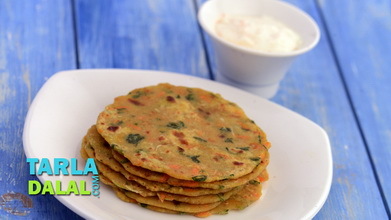 These parathas taste best when served hot with pickles and curds, but they may also be carried in a dabba. Combine the whole wheat flour, ghee and salt in a bowl and mix well. Add enough water and knead into a semi-stiff dough. Keep aside. Add the potatoes, salt, chilli powder, coriander, dry mango powder, mix well and cook on a medium flame for 1 to 2 minutes, while stirring continuously. Divide the stuffing into 12 equal portions and keep aside. 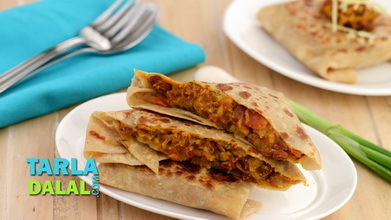 To make aloo paratha, divide the dough into 12 equal portions and roll a portion of the dough into a circle of of 100 mm. (4”) diameter circle. Place a little stuffing in the centre of the circle. Roll again into a circle of 150 mm. (6”) diameter circle with a little flour. 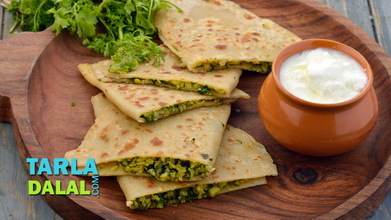 Heat a non-stick tava (griddle) and cook the paratha using a little ghee until golden brown spots appear on both the sides. Repeat with the remaining dough and stuffing to make 11 more aloo parathas. 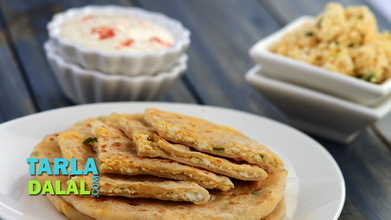 Serve the aloo paratha immediately with fresh curds.